Together Through Life is the 33rd studio album by singer-songwriter Bob Dylan, released on April 28, 2009, by Columbia Records. The album debuted at number 1 in several countries, including the U.S. and the UK. It was Dylan's first chart-topping album in Britain since New Morning in 1970. Dylan wrote all but one of the album's songs with Grateful Dead lyricist Robert Hunter, with whom he had previously co-written two songs on his 1988 album Down in the Groove. In an interview with Rolling Stone magazine, Dylan commented on the collaboration: “Hunter is an old buddy, we could probably write a hundred songs together if we thought it was important or the right reasons were there... He's got a way with words and I do too. We both write a different type of song than what passes today for songwriting.” The only other writer Dylan has ever collaborated with to such a degree is Jacques Levy, with whom he wrote most of the songs on Desire in 1976. The album received two Grammy Award nominations in Best Americana Album category and "Best Solo Rock Vocal Performance" category for "Beyond Here Lies Nothin'". Dylan is backed on the album by his regular touring band, plus David Hidalgo of Los Lobos and Mike Campbell of Tom Petty and the Heartbreakers. Dylan commented on Campbell's guitar work in his interview with Flanagan: "He's good with me. He's been playing with Tom for so long that he hears everything from a songwriter's point of view and he can play most any style." Rumors of the album, reported in Rolling Stone magazine, came as a surprise, with no official press release until March 16, 2009—less than two months before the album's release date. Dylan produced the record under his pseudonym of Jack Frost, which he used for his previous two studio albums, Love and Theft and Modern Times. The album was rumored to contain "struggling love songs" and have little similarity to Modern Times. "Beyond Here Lies Nothin'" was available as a free download for one day on Monday, March 30, 2009, via Dylan's official site. The album's cover photo is the same as that on the cover of American author Larry Brown's short story collection, Big Bad Love. It is a picture taken by photographer Bruce Davidson. As with some of Dylan's albums before Together Through Life, Dylan has adapted lyrics from other songs and incorporated them into his own lyrics—if with perhaps a 'slightly diminished use of the light-fingered lift', compared with 'Dylan's lyrical approach from recent albums'. The phrase "If you ever go to Houston, you better walk right" is taken from the folk song "Midnight Special": Dylan played harmonica on Harry Belafonte's 1962 recording of the song. 'The one time he overtly used someone else's song as a springboard for his own - Billy Joe Shaver's "Ain't No God in Mexico", a clear template for "I Feel a Change Comin' On" - he openly acknowledged the debt to historian Douglas Brinkley'. In a conversation with music journalist Bill Flanagan, published on Bob Dylan's official website, Flanagan suggested a similarity of the new record to the sound of Chess Records and Sun Records, which Dylan acknowledged as an effect of "the way the instruments were played." He said that the genesis of the record was when French film director Olivier Dahan asked him to supply a song for his new road movie, My Own Love Song, which became "Life is Hard". Indeed, 'according to Dylan, Dahan was keen to get a whole soundtrack's worth of songs from the man' - and "then the record sort of took its own direction." Reception has been favorable. The record maintains a score of 76/100 at critic aggregator MetaCritic ("Generally favorable reviews"). During the Flanagan interview, Dylan gave his own thoughts about how the record would be received: "I know my fans will like it. Other than that, I have no idea". Rolling Stone gave the album 4 stars out of 5. Describing the album as a "murky-sounding, often perplexing record", David Fricke of Rolling Stone writes, "Dylan, who turns 68 in May, has never sounded as ravaged, pissed off and lusty". BBC noted that the album is "a masterful reading of 20th century American folk, albeit shot through with some mischievous lyrical twists" and compares it to "some Chicago urban blues tribute". According to Mojo, "Together Through Life is an album that gets its hooks in early and refuses to let go". The reviewer described it as "dark yet comforting". Uncut and Blender both gave the album 5 stars out of 5, saying that it was "unbelievably good." iF Magazine.com says it "explores the bluesy side of his skills in a slight, but delightful set of ten originals." Corey DuBrowa of Paste Magazine, in his 8.10/10 review, stated: "Dylan’s never spent much time contemplating the rearview mirror, but Together Through Life finds him more resolutely focused on the treacherous horizon ever before: Song after song decries the mess we’re in (the sneering, sarcastic jump-blues “It’s All Good,” in which Dylan’s ravaged voice attacks the clichéd phrase as if it represented every banker, politician and Ponzi-scheme cheat he could conjure; “My Wife’s Home Town,” a bluesy jaunt that surveys the current economic wreckage as if from the passenger-side window of a car up on blocks) without forsaking the idea that love—and the comfort we find in shared misery—is essentially all we have left when a lifetime of ambition and achievement are swept away by the winds of change. You’d have to go all the way back to 1974’s Planet Waves—which Dylan summarized as “cast-iron songs & torch ballads”—to find a record on which he sounds so simultaneously anxious and enervated. Indeed, when Dylan croaks in “I Feel a Change Comin’ On,” “[I’ve] got the blood of the land in my voice,” you can hear quite plainly the sadness, disappointment and exhaustion of which he sings." The album is available as a one-CD version containing only the new material that Dylan recorded, or as a 3-disc deluxe version including the album itself, the "Friends & Neighbors" episode of Theme Time Radio Hour and a DVD featuring an interview with Dylan's first manager Roy Silver (recorded for the Martin Scorsese documentary No Direction Home, but unused). There is also a two-LP deluxe vinyl version, containing the same songs as the CD. In the US, the CD is included as part of the vinyl package. All lyrics written by Bob Dylan and Robert Hunter, except where noted; all music composed by Dylan. When pre-ordered from iTunes, consumers also got a bonus track of a studio rehearsal of "Lay Lady Lay" recorded in 1969. 1. "Roy Silver – The Lost Interview (DVD)"
The album debuted at number 1 on the Billboard 200, selling 125,000 copies in its first week of release. It then reached number 1 on the Top Internet Album, Top Digital Album, Tastemaker, Top Rock Album, and Most Comprehensive Album listings. In the U.S. the album has sold more than 300,000 copies to date. ^ "Bob Dylan: Together Through Life". AnyDecentMusic?. anydecentmusic.com. Retrieved 13 June 2018. ^ "CANOE – JAM! Music SoundScan Charts". Jam.canoe.ca. 2012-01-05. Retrieved 2012-01-13. ^ "Ireland Albums Top 75 - Music Charts". Acharts.us. Retrieved 2012-01-13. ^ "UK Albums Top 75 - Music Charts". Acharts.us. 2012-01-08. Retrieved 2012-01-13. ^ "Irish album certifications – Bob Dylan – Together Through Life". Irish Recorded Music Association. ^ "British album certifications – Bob Dylan – Together Through Life". British Phonographic Industry. Select albums in the Format field. Select Gold in the Certification field. Type Together Through Life in the "Search BPI Awards" field and then press Enter. "Bob Dylan beats The Enemy to Number One". NME. May 3, 2009. Archived from the original on January 7, 2018. Retrieved January 7, 2018. "Bob Dylan Talks About Working With Robert Hunter On 'Together Through Life'". Rolling Stone. May 3, 2009. Archived from the original on May 29, 2017. Retrieved January 7, 2018. "Bob Dylan – Together Through Life (australian-charts.com)". Hung Medien. Retrieved February 4, 2018. "Bob Dylan – Together Through Life (austriancharts.at)" (in German). Hung Medien. Retrieved February 4, 2018. "Bob Dylan – Together Through Life (charts.org.nz)". Hung Medien. Retrieved February 4, 2018. "Bob Dylan – Together Through Life (danishcharts.com)" (in Danish). Hung Median. Retrieved February 4, 2018. "Bob Dylan – Together Through Life (dutchcharts.nl)" (in Dutch). Hung Medien. Retrieved February 4, 2018. "Bob Dylan – Together Through Life (finnishcharts.com)" (in Finnish). Hung Medien. Retrieved February 4, 2018. "Bob Dylan – Together Through Life (hitparade.ch)" (in German). Hung Medien. Retrieved February 4, 2018. "Bob Dylan – Together Through Life (italiancharts.com)" (in Italian). Hung Medien. Retrieved February 4, 2018. 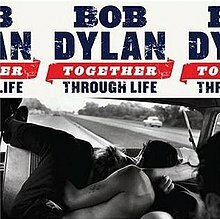 "Bob Dylan – Together Through Life (lescharts.com)" (in French). Hung Medien. Retrieved February 4, 2018. "Bob Dylan – Together Through Life (norwegiancharts.com)" (in Norwegian). Hung Medien. Retrieved February 4, 2018. "Bob Dylan – Together Through Life (spanishcharts.com)" (in Spanish). Hung Medien. Retrieved February 4, 2018. "Bob Dylan – Together Through Life (ultratop.be/fr)" (in French). Hung Medien. Retrieved February 4, 2018. "Bob Dylan – Together Through Life (ultratop.be/nl)" (in Dutch). Hung Medien. Retrieved February 4, 2018. Caulfield, Keith (May 6, 2009). "Bob Dylan Bows Atop Billboard 200". Billboard. Archived from the original on January 12, 2017. Retrieved January 7, 2018. Chadwicked (May 2, 2009). "Bob Dylan: Together Through Life". Tiny Mix Tapes. Archived from the original on May 3, 2009. Retrieved January 28, 2018. Christgau, Robert. "Bob Dylan". Consumer Guide. Archived from the original on November 15, 2017. Retrieved January 26, 2018.
duBrowa, Corey (April 28, 2009). "Bob Dylan: Together Through Life". Paste. Archived from the original on April 29, 2009. Retrieved January 28, 2018. Eccleston, Danny (April 17, 2009). "Bob Dylan: Together Through Life". Mojo. Archived from the original on April 19, 2009. Retrieved January 28, 2018. Erlewine, Stephen Thomas. "Bob Dylan: Together Through Life". AllMusic. Archived from the original on November 6, 2017. Retrieved January 27, 2018. Flanigan, Bill (April 10, 2009). "Bob Dylan talks about the new album with Bill Flanagan". Bobdylan.com. Archived from the original on April 25, 2011. Retrieved January 7, 2018. Fricke, David (April 13, 2009). "Bob Dylan: Together Through Life". Rolling Stone. Archived from the original on April 21, 2009. Retrieved January 27, 2018. Heylin, Clinton (2011). Behind the Shades: The 20th Anniversary Edition. Faber & Faber. ISBN 978-0-571-27241-9. Kreps, Daniel (March 16, 2009). "Bob Dylan's New Album "Together Through Life" Due April 28th". Rolling Stone. Archived from the original on March 19, 2009. Retrieved January 7, 2018. Jones, Allan. "The Uncut Album Review: Bob Dylan – Together Through Life". Uncut. Archived from the original on July 4, 2009. Retrieved January 25, 2018. Paphides, Pete (April 17, 2009). "Bob Dylan: Together Through Life". The Times. Archived from the original on June 17, 2011. Retrieved January 28, 2018. Phipps, Keith (May 5, 2009). "Bob Dylan: Together Through Life". The A.V. Club. Archived from the original on January 26, 2018. Retrieved January 26, 2018. Prince, David J. (August 6, 2009). "Bob Dylan Christmas Album Coming". Billboard. Archived from the original on May 7, 2017. Retrieved January 31, 2018. Sheffield, Rob. "Bob Dylan: Together Through Life". Blender. Archived from the original on January 25, 2010. Retrieved January 28, 2018. "Together Through Life by the Bob Dylan: Critic Reviews". Metacritic. Archived from the original on January 28, 2018. Retrieved January 28, 2018. Wolk, Douglas (April 30, 2009). "Bob Dylan: Together Through Life". Pitchfork Media. Archived from the original on May 3, 2009. Retrieved January 28, 2018. This page was last edited on 8 March 2019, at 17:39 (UTC).